Hopefully you’ll never need to know what do after a flood, but it’s better to have the information and not need it than experience the opposite. Because flood damage can cause structural concerns and other problems, it’s important to take these steps immediately to protect yourself and your family. When it is deemed safe for you to return to your home, be sure to. These utilities maybe off already, but you don’t want them to be turned on before you’re ready and risk mixing water and electricity or creating a gas leak before flood damage in the house is fixed. When walking in any remaining flood waters, wear sturdy shoes to protect your feet from hidden debris in the water that could cut or trip you. Wear hip waders as well since flood waters could be contaminated even if they appear clear and clean to the eye. Be alert for snakes and other displaced critters when clearing debris and never stick your hands where you can’t see. Document as much of the damage as thoroughly as you can to help yourself when filing a claim with your flood insurance company. Upon reentering your home, secure photographic evidence of the damage left behind by the water as well as any water that remains. Document as much as you can and then call your insurance company promptly. It’s important to prevent further damage to your property by making sure it is secure. Board up windows and other damaged entryways that can no longer be locked. Tarp the roof if it has been damaged to keep even more water from getting into the home. When securing the home, take a look around and determine realistically how livable the property is. If you can’t stay there, don’t. 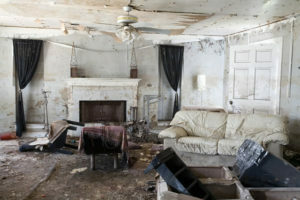 Mold damage is a common source of flood damage in a house and needs only 24 to 48 hours to take hold. Throw away items that have been saturated for more than 48 hours and decide on other items on a case-by-case basis. Mattresses, rugs and other items may be able to be professionally cleaned after drying out but it may not be worth the cost. Throw away any food or medications that have come into contact with flood water. Though things may feel out of control, knowing what do after a flood allows you to take control of the things you can. With the help of a damage remediation company, your home and many of the things inside it can be saved. You may need to stay elsewhere while repairs are completed, but life will get back to normal again. We 24/7 Technicians on the road ready to respond to the incident’s address.